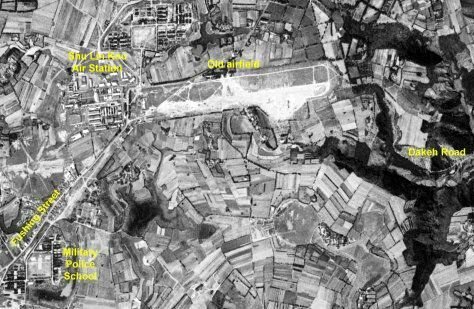 For several years, I have been trying pinpoint the location of former Shu Lin Kou Air Station, a military installation responsible for gathering sensitive intelligence from the 1950s into 1970s. But the landscape of Linkou has changed so much in last decades that almost no leftovers of the installation can be found on Google Earth. Fortunately, with CORONA satellite imagery available, I can finally locate this secretive site by comparing the landmarks and roads that still remains nowadays. 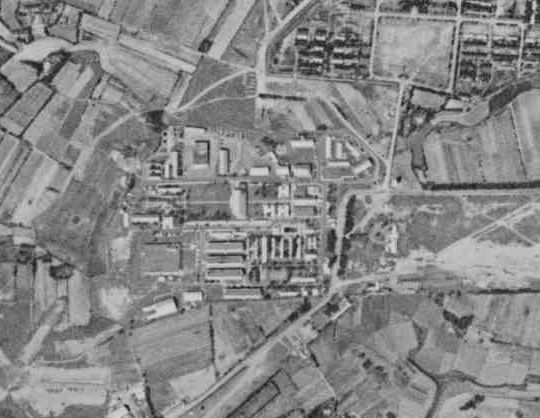 Shu Lin Kuo Air Station in 1966. There is an abandoned airfield built by the Japanese in the WWII era on its east side. Shu Lin Kuo Air Station in 1969. 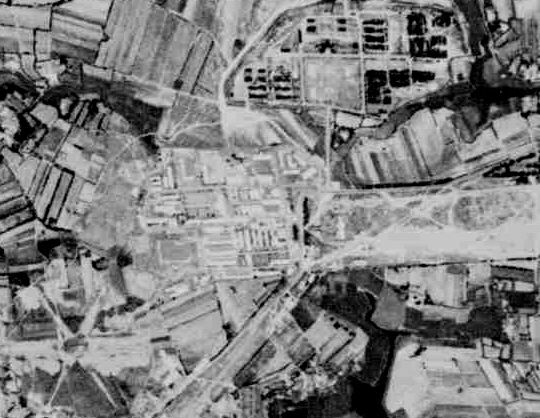 Shu Lin Kou Air Station and its neighborhood in 1969. The current Military Police School can be seen in the image, although I am not sure if it was used for the same function at that time. “The winding road up the hill” referred to by this page must be Dakeh Road. 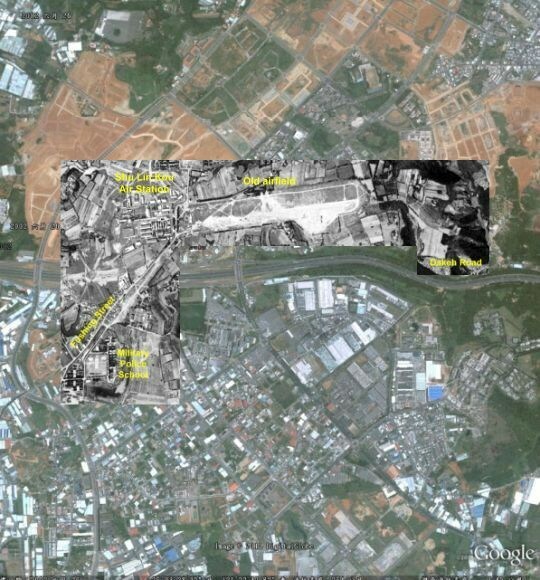 The extent to which Lin Kou area has changed in last forty years is obvious in this 2002 Google Earth image. Luckily, the MP School, Fushing Street, and Dakeh Road remain today, which proves to be very helpful to my work. The 1969 CORONA image overlaid on top of 2002 Google Earth photo. Very nice research! It looks like Shu Lin Kou is no longer there. I drove by it last week. It’s just a deserted field now. If you want a photo of ot, I can send you a google photo. But nothing there but grass. Great research. I would like a google photo if possible. Lots of memories there…now nothing but grass. Gary, please check your email. Thanks. I have overlaid the 1969 satellite image on Google Earth. For the kmz file, please see the text marked in red in the post. what are the coordinates so I can find it on google earth? John: The coordinates given by Google Earth are 25° 4’4.27″N 121°21’45.54″E. You may want to download the kmz file at http://bbs.keyhole.com/ubb/ubbthreads.php?ubb=download&Number=951104&filename=Shulinkuo1969.kmz to explore the overlayed image on Google Earth. I was stationed there from 1967 to 1969. Joey D, Perk, Mother Ugly, Major Betty, Lebow, Taiwanese Charlie, Freedy Eck, Gulley. I have marked up a Google view to show the correct position of the old ShuLinKou Air Station. I was stationed there from 1959 to 1962. Visited there in 2001 as the last buildings were being demolished. I have a few photos of some of the remains. I would be happy to forward the marked up view and a photos if you will give me an e-mail address. I was at Shu Linkou 1970-1971. This brings back great memories of a marvelous time. Francis: Nice to see you here! A while ago I e-mailed you my location of the former ShuLinKou Air Station. I did not hear from you since then and wonder if you received my marked up maps ok. I notice that the location I consider in error is still posted on this web site. My establishment of the site is based on the road that we travelled to and from TaiPei. That road still exists and I have some additional mark ups available if you would wish to see them. 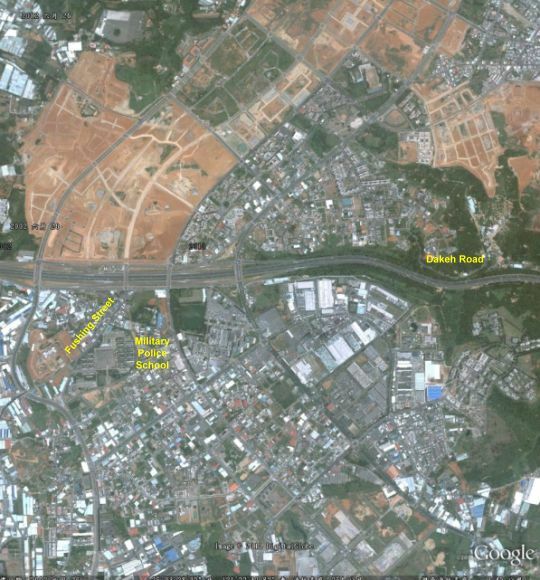 This web site and the Tripod web site both have entries placing the former site closely adjacent to the Sun Yat Sen freeway. I absolutely know that location is not correct. I have been trying to obtain proof from sources that might have maps, aerial photos, or latitude/longitude coordinates of that site. I would place the center of ShuLinKou air station at 25 deg 04′ 43.77″ N and 121 deg 22′ 46.37″ E. I have several google views with mark ups to substantiate my conclusion. However, I am seeking from a qualified source a map, hopefully with coordinates, or aerial photo with a wide enough perspective to confirm my conclusion or, alternatively, map coordinates of that site from a qualified source such as a land commissioner. Would there be an office, agency, or school in TaiWan that could supply such data? I would most certainly be happy to send you my new mark ups. The road mark up is most compelling and I have prepared some views explaining the approach path to Sung Shan Airport, which was directly over ShuLinKou for the straight in path. Thank you and hope to hear back from you. Bill: I am sorry that you missed the email I sent a few months ago. I just sent you another email. Please check your mailbox. Thank you. Bill, you are most welcome. Should you need additional information, just let me know. BTW, I will blog on my discovery of the location of the Japanese airfield in Linkou in a few days. Then I will update my work on SLK air station. I was there when Kennedy was assassinated in 1963. Elint operator.We had a remote site just outside of Lin Kou Village overlooking the coast.A couple trailers and a couple antennas.WE blew the outhouse on July 4th with huge fireworks purchased from downtown Taipei. 1970-71 & 73-74. My best assignment. The “winding road up the hill” was not Dakeh Rd. You need to look a little farther east, look for rd “106”. The new Highway 1 opened a few weeks after I arrived at SLK in early 1974. Those of us with motorcycles continued to use 106 to get to/from Taipei. Motorcycles were prohibited on Hwy 1. I was stationed at SLK Mar 1957-Aug 1958. I was a 202 (Radio Traffic Analyst). Anyone out there that was there at the same time? I was there during the same period as Don White (’57-’58)…I was a Morse Intercept Operator…. The 6927th RSM site at Onna Point, Okinawa underwent a similar metamorphosos. After USAFSS went out of business in March1972, it was vacant for a while and subseqnently was subsequently used to train dogs by the Marines. It later became home to a USMC recon unit. Ultimately, the site was found to contain traces of mercury and PVBs in the soil and the whole place was totally razed down to digging up the roadways and the slabs that the buildings sat on. It’s funny. When I was there, I couldn’t wait to get back to te “land of the big BX. But, today, more than 50 years later I hae fond memories of the place. As a result, I run a web site about Onna Point at http://6927.53merc.com. Also as a former 203 (Voice), I also maintain a site about the Chinese Language program at Yale at http://ifel.53merc.com. I was stationed at ShuLinkou 76th (or was it 176)USASA during 1961-1962. My path to Taiwan was via 1. Basic: Ft Leonard Wood (MO) 2. Clark Airbase PI..3. Okinawa (billeted with USAFSS.. finally to LinKou…My MOS was 056 and our little shack was several miles out in the boonies from Ops next to a DF Antenna installation. Somehow or another I wangled a job in off-time as the MC at either the Linkou Club (Enlisted) or the 63 Club. Also had the privilege of directing a chorus that had some awesome voices…we did a Christmas program and then I directed a Revue of “South Pacific” (how fitting) backed up by a fabulous Filipino orchestra led by Rudy Arevallo. Friends: Herb Taylor (fluent in Mandarin)…Mike Kyle from CA..Charlie West…amongst others. After volunteering to go TDY to Bangkok Uncle Sam paid for my wife to “come over” and we rented a sweet little house nestled in the side of the mountain that I think was called YangMinShan (right above The Grand Hotel. I could go on and on but I have used up too much space as is. Life changing and memorable times!!!!!! I was there in 1957-58, Radio Intercept Operator. Back in the States the USAF sent me to IBM school, which provided the start of a 42 year career in IT. I was stationed at the 6987th RSM from November 1961 through February 1963. 202 (morse intercept analyst) in the bomber shop. While I was too young to fully appreciate the significance of my experiences there, nonetheless this assignment changed my life. The site designation was changed to the 6987th RGM January 1963. Great photos. Thanks for the site. 202X0 R/T Analyst Dawg Flight March 1968-June 1969. I just had my Medicare birthday. SLKAS is so long ago. First assignment and a real eye-opener to the USAFSS and a new world. Tried for years to pinpoint my dorm. Thanks for doing all the work. I was a 056/058 in the 176th USASA in 1957, 58 and 59. If anyone remembers me, Don Hornbuckle, Roger Cannon, Darwin D Dumas (3D) I would like to hear from you. My e-mail is jaykay100@gmail.com and my phone is 909 224 8212. You mentioned some names I’d totally forgotten–and just as well. However, Taiwan Charlie was my roommate and Fred Eck is from Cleveland as I remember. I remember you too. Hope all is well. I put up a Facebook page just in case he might try to find me. Charlie Daniels is too common a name to narrow down researching. I heard some sad news about a guy with his name from Queens. I hate to think in was my buddy. Hello Shu Lin Kou vets> I was there 76 ane 77> Had a great time> A lot of memories and it was my first duty station. If anyone knows where Willie Carmack is pls post a comment or call me in Taylor Tx. at 512 595 416. I’d really like to hear from anyone. Thanks for this website! I was with the 76thUSASASOU from 1964-66.ASA Linkou Vets should be advised that there is a face book page called: ASA Shu Linkou Veterans…There are over 50 of us from this time period + lots of photos and a video that was taken after the closing. There will be an ASA Linkou reunion next May in Reno. Pat and Herchel…I remember both of you guys. I was a “jeep” right out of tech school. I was there from October 1967 until October 1968. What a great place! Loved my tour there, and really didn’t want to leave. A couple of other names that came to mind after I made my original post are: Art Pettigrew, “Pope” John, John Olchewski (sp), “Pancakes” Claussen, Ed Suarez, Bill Pogue, Snale, Dave Ammerman, CMSGT Cleary. Probably will think of some more later. Remembered Dave Holt and Alvin Coffey. Then there was SSGT. Cornett(SP), who organized all the island tours for us. There is a website for USAFSS PERSONNEL formerly stationed @ Shu Linkou AS, Taiwan. I was a 202 Traffic Analyst Aug 1962 to Oct 1963. Best tour I had in SS including 3 years Germany, and a year @ 6988th @Yokota, Japan. I was especially fond of PEITOU ! Great website. A friend just turned me on to it while we were discussing our time spent in Taiwan. I was stationed at SLK in either 71-72 or 72-73 with USAFSS as a Morse Intercept Operator. I went there after they closed Hakata Air Station in Kyushu, Japan. After Taiwan, I finished out the last year of my enlistment at USAFSS HQ in San Antonio and got out of the bag in 74. Only names I can remember from my time in Japan and Taiwan were my former roomie, Frank Smith, and Bruce Tichenor, who went on to tour with Tops in Blue. Oh, and then there’s my former next-door neighbor in Japan, Ben Allen, and his wife, Jan.